Many people have problems with their Temporomandibular Joint (TMJ). Symptoms from TMJ disorder include clicking, popping, dislocation, and pain. It is a very common disorder and is seen in much of the population. Even if you have no pain in your TMJ, problems with your “bite” can start to be seen on the tops of your teeth as well as next to your gum line. This eventually may lead to problems in your TMJ. 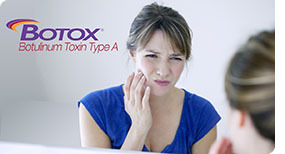 One of the most promising new products we use for TMJ therapy, is Botox therapeutic injections. Botox, or Botulinum Toxin, is a neurotoxin in the form of a purified protein. It works by blocking the transmitters between the motor nerves that innervate the muscle. Botox, along with occlusal splints and/or nightguards, is an alternative treatment for jaw tension, muscle tension, and associated pain. When injected into sore and inflamed facial and neck muscles, it’s most common benefit is the reduction of clenching/grinding events and their intensity by making the muscle unable to fully engage in those powerful movements. This reduces the discomfort and pain in your face and chewing muscles. Most patients experience a noticeable improvement within 1-2 days of their first treatment, although relief can take up to 10 days.The effects of Botox are temporary and usually last up to 3 months. Dr. Robinson was trained in Botox Therapeutic through the American Academy of Facial Esthetics.